The following articles are about our 2007 "Power Puzzle" FLL season. The following articles are about our 2006 "Nano Quest" FLL season. The following articles are about our 2005 "Ocean Odyssey" FLL season. The following articles are about the 2005 World Festival in Atlanta, Georgia. One of our coaches was interviewed on New Hampshire Public Radio! NH's International Lego Champions - Listen to the Interview! The following articles report on the 2004 NH State Tournament. We even had two articles printed about our 2004-2005 "No Limits" project! The following articles (and video) are about the 2004 International Championship in Atlanta, Georgia. 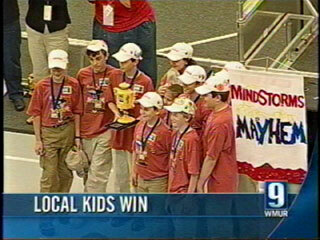 WMUR evening news segment, "Lego Payoff / Local Kids Win." The following articles are about our team and some of the things we have done since the 2003 New Hampshire State tournament. The following articles (and video) are from our press conference at the NH State House on February 19, 2004. 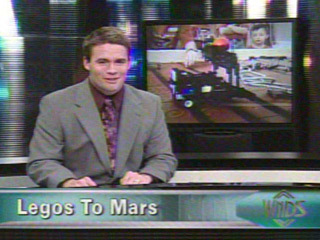 WNDS evening news segment, "Legos to Mars." The following articles are about the 2003 NH State Championship. They have various quotes from our team.